There are quite a few German greetings, some are formal while others are fairly casual. 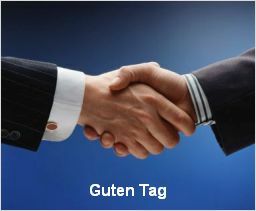 Additionally, you'll find different ways to say Guten Tag in the north and the south of Germany. You use these greetings in slightly formal situations, when you enter a shop, or to greet people you don't know yet. There are no strict rules about the exact time when you change from saying Guten Morgen to Guten Tag and to Guten Abend. Generally, you say Guten Tag from noon to 6 pm. A handshake "Handschlag" is fairly common in Germany, especially in business meetings. Friends give each other a hug, or a kiss on the cheek when they greet "begrüssen" each other. Notice the missing n in Gute Nacht? That's not a typo. It is because die Nacht is a feminine noun and goes with gute, while der Morgen, der Abend, der Tag are masculine and use guten. Moin Moin Although "Moin Moin" sounds a little like Morgen, people in Hamburg, East Frisia and parts of Schleswig-Holstein use it all day to greet people, even at night. 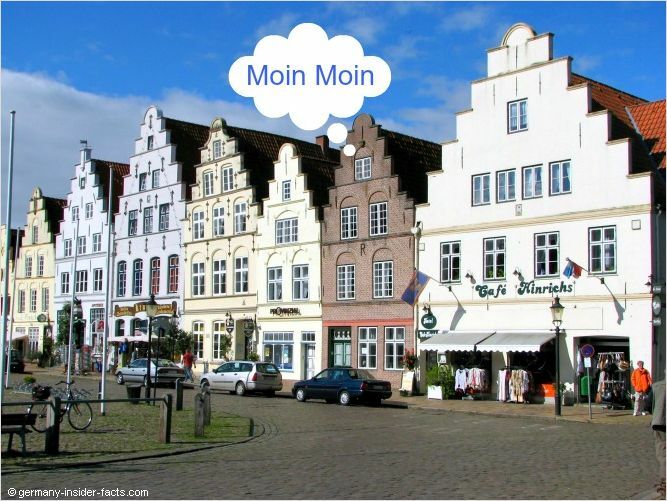 In Hessen a single "Moin" is used to say Guten Morgen. Grüß Gott Like Moin Moin, Grüß Gott is used at any time of the day in Bavaria and in the south of Baden-Württemberg. Hallo This is a word that sounds familiar, right? It is the most simple and casual way to say hello, especially to people you know. Grüß Dich Literally translated "greet you" is a German phrase to say hello to someone you know well. Use it only when you are "per Du" with someone. You can use Moin Moin, Hallo and Grüß Gott whether you are "per Du" or "per Sie" with someone. Although is fairly casual, it has become quite common to use "Hallo" in shops, at the doctor's, and restaurants. Auf Wiedersehen Goodbye - You never go wrong to say "Auf Wiedersehen", although it is slightly formal. A short form is to say just "Wiedersehen". Tschüss Very common and slightly informal way to say goodbye. Mach's gut Literally translated "do well", you can use this to say bye to people you are "per Du" with. You will hear more goodbye greetings when you are in Germany, "Ciao" or "Tschau", "bye-bye", "bis dann" are just a few of them. Guten Tag and Auf Wiedersehen are the main phrases you should know, but I thought I tell about other phrases as well. You will hear them quite often. What do you want to learn next in my free German lessons?